Our product range includes a wide range of outdoor enclosures, industrial outdoor enclosures and stainless steel outdoor enclosures. 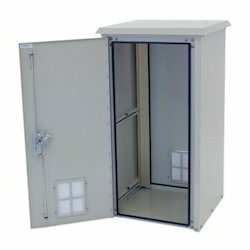 We are the pioneer manufacturer of wide range of Outdoor Enclosures, which is used to keep equipment in a safe manner. These are manufactured using quality tested raw material to ensure durability and minimum maintenance. Our range is widely acknowledged for corrosion resistance, shock proof and durability. We provide customization on our range as per the specifications of clients. The best IP protection (IP-55). Modularity for internal assembly. Doesn’t require more pre-engineering. Rain canopy is fitted on top of the enclosure to minimize rain water contact with enclosure. Punched holes having a pitch of 12.5mm. Depth and height adjustable mounting of the component plate and horizontal/vertical partitions. at 100ºC temperature) on doors and covers for better IP protection. Stronger support channels (plated or powder coated) screwed on the doors. Clamped and folded gland plates in parts for easy removing and fitting. Gland holes not necessary to decide earlier can be drilled at the site also. Sheet metal folded base looks attractive with ease in grouting (Grouting holes visible). ISMC base also can be provided. Detachable all the doors and covers facilitates faster interior assembly. Stainless Steel hinges and hardware is used for long lasting. Eye bolts are fitted in depth angles used for component plate mounting which is firmly welded to. enclosure to resist UV rays and fading effects due to the outdoor environment. effects due to the outdoor environment. It lasts double the normal enclosure. For the high corrosive area, these are manufactured in stainless steel. It is life long lasting. 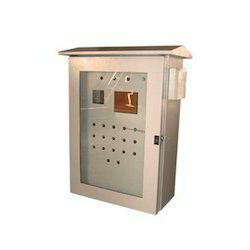 As a trust worthy organization of this domain, we are committed to offering our clients a superior quality assortment of Industrial Outdoor Enclosures. Under our experts’ supervision, the offered enclosures are precisely designed and manufactured using a top-notch quality metal sheet and iron bars with the aid of sophisticated techniques. 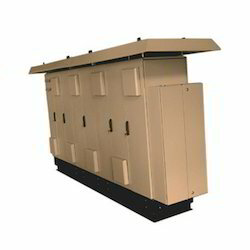 These enclosures are manufactured according to the industry standards. Additionally, we are offering these enclosures at the best market rates to our valued patrons. Owing to the expertise of our team of experienced professionals, we are able to introduce an exclusive range of Stainless Steel Outdoor Enclosures. Extensively used for in commercial, domestic and industrial sector. The offered enclosures are designed and manufactured using premium grade steel raw materials with the help of modular techniques by our adroit professionals and also by adhering to IEC 529 and BC5490 standards and can provide protection up to IP 55-67. Apart from this, the offered enclosures can be installed at pocket-friendly prices. Looking for Outdoor Enclosures ?